A small wooden gate at the roadside leads to an old Quaker cemetery. The area is fairly large, but perhaps only a third currently has any head stones, property was owned in the area as early as 1658 although the ‘Castleton Meeting’ formed in 1719 and ran until 1924. Although generally omitted from modern maps, ‘Friends Burial Grounds’ always used to be marked as this 1913 example shows. I must have a trip out to browse this little graveyard. What is that legend marked in the large field on the opposite side of the road? I think its referring to the Guisborough Poor Law Union. 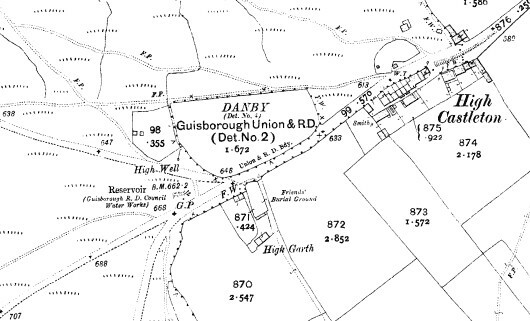 The Guisborough Poor Law Union was formed in 1837, and comprises the following parishes and townships, viz. :- Brotton, Commondale, Danby, Easington, Guisborough, Hutton Lowcross, Kilton, Kirkleatham, Liverton, Loftus, Marske, Moorsholm, Morton, Newton, Pinchingthorpe, Redcar, Skelton, Skinningrove, Stanghow, Tocketts, Upleatham, Upsall, Westerdale, and Wilton. The total area is 72,090 acres; rateable value, £257,340; and the population, according to the last census, 43,126. The Workhouse is situated in Northgate, and was erected in 1839, at a cost of £2,629, for 120 paupers. It has been enlarged since that time, and will now accommodate 172. The average number of inmates for the year ending March, 1889, was 131. Good stuff. I know the old Workhouse is now part of Guisborough Hospital.